Four years ago, I set a goal: to win the Rio Olympics. In 2012, Patrick and I asked Jamie if he thought winning gold was possible. He said, “You need to improve your swim, improve your bike, and probably run high 32 minutes.” Jamie was right about two out of the three (my 10km in the race was a 34 something). Jamie’s confidence in my ability to be an Olympic Champion didn’t come until London at the WTS in 2015. I was sick the week of the race. I was struggling to just get out of bed in the morning. I did efforts the day before the race and could barely breathe. My legs were heavy, my nose was stuffed, and the last thing I wanted to do was race. I was underprepared for the race and I wasn’t firing on all cylinders, but I came away with the win. It was the first time I proved I could perform under pressure. 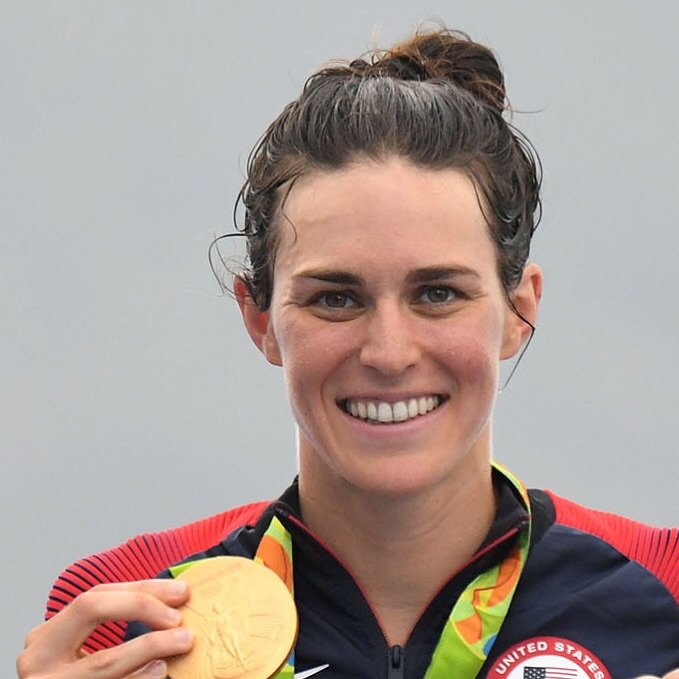 What’s it like to win the Olympics and achieve a four-year goal? It's pretty awesome! I’m enjoying it all and am still on a high a week later (I’m wondering if/when the low will come). I had four years to prepare for one day and I executed on that day. It’s pretty remarkable and only happened with the help of Jamie Turner, my husband Patrick Lemieux, and my many other supporters. What happens after the race is over? Immediately after the awards ceremony, I was interviewed at the race site by about ten different media outlets. I was then taken to drug testing (blood and urine). A press conference with Nicola Spirig and Vicky Holland followed. After, I was taken to the International Broadcast Center (which was an hour and a half away) for more interviews and media. At this point, I was starving and really wanted a shower. I got food, but the shower had to wait…At 10pm, I joined Team USA at the USA House for a celebration with family and friends where I awarded Jamie with the Order of Ikkos for his commitment and dedication. After the party, Patrick, Jamie, and I had drinks at our hotel. I had a caipirinha, which was way too strong for me. I stumbled to my room at 2am where I was finally able to brush my teeth and take a shower. The next morning, we were up at 8am for more interviews. I flew to NYC the following day with sponsor ASICS for more media opportunities, including CNBC, CBS, CNN, Fox, SI and AOL…and surprise tickets to the hottest show on Broadway, Hamilton. Red Bull was also on-site to help organize this whirlwind trip and Columbia Threadneedle treated me and Pat to a delicious celebration dinner at Morimoto. Every day, I got to wear gorgeous dresses by designer Gabriela Hearst and other fun outfits by Tory Burch and Michael Kors. I had my hair and makeup done daily – I felt like a princess (fun fact: I don’t own any makeup). After Hamburg, I told Jamie I wanted to see a sport psychologist. I was complacent in Hamburg and I was nervous I had lost my fire before the biggest race of my life. Jamie insisted, “No new faces. Stick to the plan. You are lucky, Gwen. All you have to do is what you’ve already done.” Thanks, Coach Jamie, for always knowing what to say. After our conversation, I focused on training and wrote my Rio race plan, which calmed my nerves. The week of the race, I have never been so calm. I wasn’t nervous, but instead, I was excited. I knew the work was done and I was ready. It’s strange, though, because at the test event a year prior, I was equally as prepared, but I was not as calm. In 2015, I had a huge fear of getting a mechanical or flat on the bike course. For some reason, which I can’t explain, 2016 was different. It was also the first time Patrick hasn’t been nervous for one of my races. We were both just at peace and ready for the race, no matter the outcome. We dedicated four years of work, sweat, tears, and investments into this one day and knew we had done everything possible to prepare. We were stubborn at times, refusing interviews during my blackout period and not taking in the whole Olympic experience. At the Olympics, there are sponsor and hospitality houses: The Oakley House, Red Bull Athletes’ Lounge, Beats Barra House, USA House, P&G Family House. Each one is unique, but the goal is to have a place to hang out, eat good food, watch the Games, and get in the Olympic spirit. In 2012, the houses were my favorite experience; but in 2016, I refused to go because I knew it would distract me from the race. 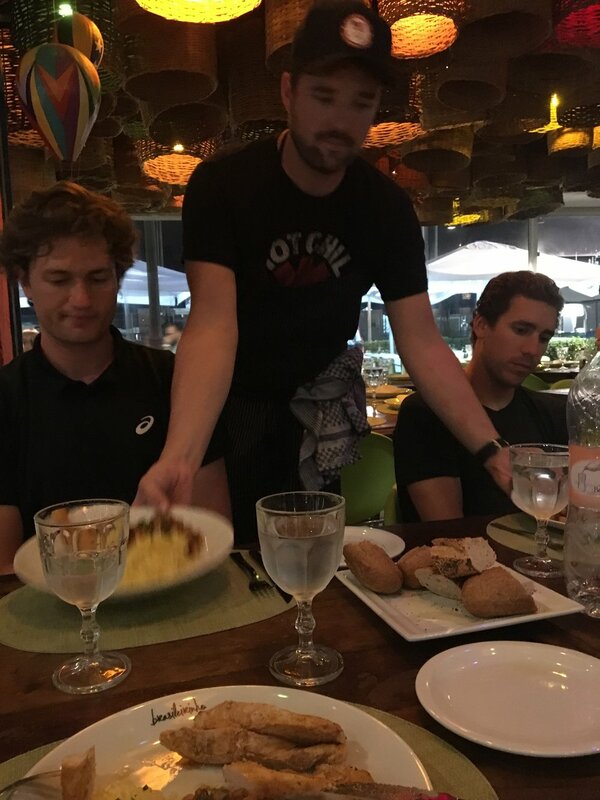 I missed out on some good food, but, fortunately, USAT had an amazing chef (Adam McCluskey) cooking whatever we wanted while in Rio. I was eating like a queen and Patrick didn’t have to cook either which was a nice break for him (maybe this is why he was so calm?!). Fortunately, my family was able to reap the benefits of the houses – thank you for welcoming the Jorgensens. They had a blast! Pat and I were also stubborn in refusing interviews. In January, I did up to ten interviews a week and it was stressful. Media exposure is beneficial for my sport and personal sponsors, but I have to carefully balance interview requests to ensure my training remains a priority. Pat, Jamie, Heather, and I came up with a plan: two interviews per week and no interviews after July 1st. It worked great for me, but news outlets weren’t always happy. We stuck to the plan but only because we refused to comprise the goal of winning the Olympics. The swim: The swim was standard. I was in a good position the entire swim, until about 200m to go when I lost a few places. I’m still not sure how or why, but I exited at the end of the pack in about 24th place after being in the top 10 for most of the swim. The bike: The first lap of the bike, I was under pressure and in a bad position at the back of the pack. After a few laps, I was able to work myself up to the front. I had more fun riding in this race than in any other race. Ever. I felt strong and confident. It felt like a game we were playing. I would go to the front, but then Nicola would attack and I and/or the group would cover the move. Because Nicola was attacking, others were not encouraged to lead (if someone went to the front and took a turn, Nicola would attack and they risked being dropped). The run: I planned to build throughout the 10km. I was running strong, ready to put in a surge after two laps, when I noticed Nicola was still with me. I wasn’t sure if Nicola was suffering or not, and I wanted her to take the lead so I could get a better read of the situation. On the third of four laps, Nicola was hesitant to take the lead. We were running into a headwind and it’s easier to sit on in a headwind than take the lead. Nicola said she decided to play mental games. “I lead last two laps,” I responded. “I don’t care. You also are a mother and that’s more impressive!” I responded. I respect Nicola. She is a strong athlete, but she is also someone who proves you can be a mother and an amazing athlete. I’m so glad she decided to continue in sport after having her son. Anyway, our conversation happened while we were running and I’ve been told it looked quite strange on TV. 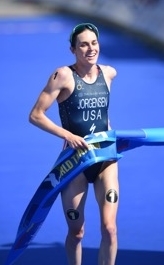 I can tell you that there is no playbook for triathlon and what happened on August 20th has never happened before, and will likely never happen again. It’s why athletes train to expect the unexpected. Nicola took the lead after our conversation and as we rounded the turnaround, we were in a tailwind. If Nicola was tired, it would be more difficult for her to surge with me in a tailwind (as opposed to a headwind), so I surged and didn’t look back. I only focused on getting to that finish line. I couldn’t hear Nicola behind me, but to be honest, I didn’t hear her the first two laps either (the crowds were too loud – which is a good thing!). I came to the final turn with about 1.25km to go and saw I had created a small gap. A white board said I had a 9 second lead. I thought the race was going to come down to a sprint, so I continued to run hard until I crossed the line. It wasn’t until way later that I learned I had won by 40 seconds! What was I thinking after I crossed the finish line? It was such an emotional day. My first thought was Where are Patrick and Jamie?! but I was paralyzed with tears. It’s hard to explain, but after four years of work, it was a mixture of emotions: joy, happiness, relief, pride, thankfulness, disbelief…Everyone has supported me so much - Patrick, Jamie - all these things just were overwhelming and I broke down in tears. I need to acknowledge and thank all of my sponsors: they have stuck by me and supported my vision to win gold even if it meant me not giving them every opportunity to promote me. Thank you to my family and friends for their unconditional love and support. Thank you Jamie and the Wizards for getting me prepared. And thank you Patrick for joining me on this four-year journey. I am currently in Florida with the Wollongong Wizards preparing for Cozumel. Patrick and I will get tested for Zika. We are ready to start a family, but you can’t plan that, so we will just see what happens. I am also signed up for the Island House Triathlon and the NYC Marathon. I’ve always wanted to do a marathon, but when I talk about the distance, it is a bit daunting. I’m not naive and know I won’t have a good build up to prepare for the marathon, but it’s more of a bucket list type of thing. I can’t wait to test myself! After Cozumel, Patrick and I will finally head home. ☺ I cannot wait and I’m sure training will be on the backburner as we search to buy our first home and catch up with family and friends. This was me and Pat at a swim pre race. Love this photo taken by ROKA. It is me giving a kiss to Patrick as I run down to select my spot on the starting line. Thank you family and friends for coming to Rio! Thank you USAT for your support. This is my favorite picture because it tells such a story: Me and Patrick hugging with a picture of me on the big screen. So many emotions. Thank you Delly Carr for capturing this moment.